Russian rabbi and author; born in Turetz, in the government of Minsk, 1792; died at Minsk April 27, 1861. At the age of fifteen he went to Volozhin, where he studied in the yeshibah under Rabbi Ḥayyim, from which he graduated as rabbi. At the age of twenty-five he became rabbi of Stouptz, where he remained from 1817 to 1849, in which year he was elected chief rabbi of Minsk. He occupied that position till his death. There he wrote "Bet Dawid," in two parts, containing responsa and sermons. After his death the following works written by him were published: "Naḥalat Dawid," the first part containing responsa, and the second part containing novellæ on Baba Ḳamma and Ḥullin (Wilna, 1864); "Dibre Dawid," responsa (Wilna, 1882). 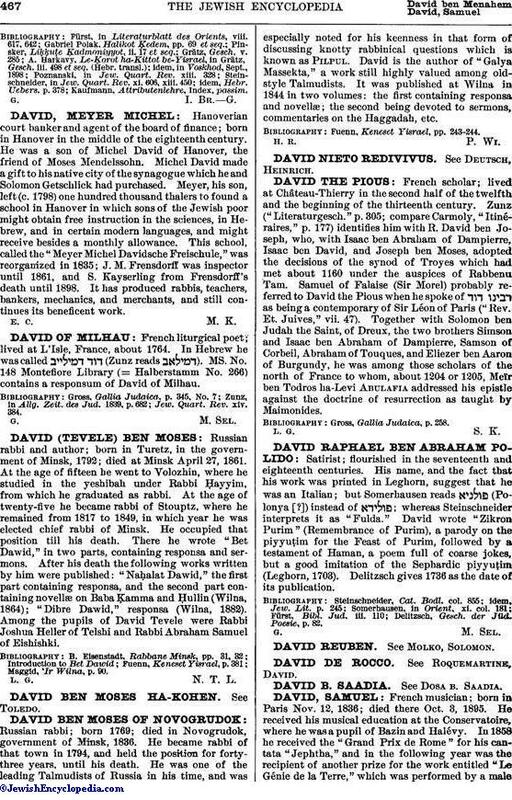 Among the pupils of David Tevele were Rabbi Joshua Heller of Telshi and Rabbi Abraham Samuel of Eishishki. Maggid, 'Ir Wilna, p. 90.